When I travel, I take very few photos. I only photograph something if the situation, location, or subject intrigues me enough to want to share it with others. During my first trip to L'Aquila in Spring of 2012, I was astonished to see knitted or crocheted elements dispersed in the remains of the town. I discovered pot-holders, centerpieces and other similar objects knotted or sewn together, stretched, skin-like, across a diverse range of urban equipment — traffic signs, benches, railings, stairways, poles, pillars, building facades, telephone booths, newsstands, worksite fences and even the trunks and branches of trees. When I got back from L'Aquila, remembering that initial and immediate fascination, I sorted out the photos of the knitted pieces found around the city. The juxtaposition of these photos created a collective echo with their similar subject matter but surprisingly the photographs did not create a cohesive unit or a collective message. These segments were materially similar and probably linked by the same collective action. Yet regrouping these photos did not generate any mutual reinforcement or any additional dynamics. These images, despite having a common subject, remained isolated and uncommunicative. This silence, this isolation, and the lack of an additional dynamic seemed even stranger given that these textile fragments gave the impression of conveying a socio-political message as though they would be able to recreate the social fabric of L'Aquila, at least symbolically. The absence of interaction among the images, their silence and the impossibility of detecting any socio-political message in the assembled photos transformed them into a simple collection of forms. This raises the question of why the potential content of these textile pieces was so diminished in the photos. The only explanation seems that the isolation of these pieces—an inevitable consequence of photographing them—underlines a global lack of coherence, a blurring which was already noticeable as they were being photographed. And that blurring seems to stem from the fact that many elements conditioning the textile pieces were, and remain, inexplicable. It is difficult to understand why a given textile object was found at a given spot, why it had a certain form, or why certain urban elements were covered with a knitted skin while others were not. It is impossible to determine whether a connection existed between different sites and the other various textile elements. Likewise, it is unclear whether the elements were meant to create an overall image, to materialize a given territory or to simply be regarded as individual gestures. If the textile elements were supposed to designate a territory, it is impossible to determine if political power plays were an underlying consideration. It is also difficult to judge whether or not the textile elements were to be construed as statements of protest or perhaps strange attempts to humanize a hostile environment, devoid of people. Upon my return to L'Aquila, I discovered that the covering and “dressing” of urban elements was not as extraordinary as I had first imagined. It was merely a local version of a form of intervention in urban spaces which originated in Houston, Texas, in 2005 and spread to other places under the label of rough knitting, yarn storming, yarnbombing, guerilla knitting, kniffiti, urban knitting or graffiti knitting. This form of intervention consisted of covering the whole or parts of certain urban elements with a knitted “skin”. In L'Aquila, these knitted or crocheted skins were replaced by knitted or crocheted segments knotted or simply assembled on diverse surfaces. I learned that the inception of this form of urban action is attributed to Magda Zayeg, the owner of a yarn store in Houston, who enveloped the door handle of her shop with a knitted cover. I must admit that I never paid much attention to the origins of yarnbombing nor imagined that it could influence the status of my photos. Later, while comparing and analysing my photos, I did further research on the back story of yarn bombing/kniffiti. I discovered that Magda Zayeg described her first object as a “Cosy”. She defined the mission of yarnbombing: “to make street art a little more warm and fuzzy.” Suddenly I found myself in a contradictory position: “cosy”, “warm”, and “fuzzy” are terms of a clearly intimate, private and apolitical nature. 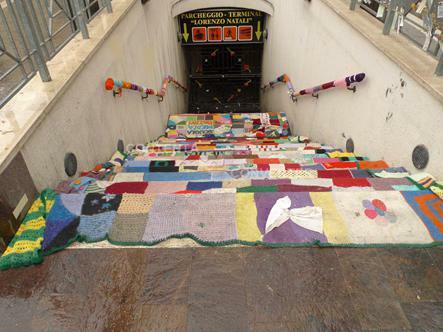 Yet yarnbombing takes place in public spaces, which gives it a political and social dimension. Thus yarnbombing is by its very origins and motivation in contradiction with the status of the elements and places it targets. Three postulates can be made concerning the incompatibility of L'Aquila yarnbombing. Each potentially is applicable to L'Aquila but irreconcilable with the two others. The first postulate is that the guerilla knitting or kniffiti does not meet its portended goal: it does not make its surroundings any cosier. It is windbeaten, dirty, torn and ends up simply disintegrating. The second postulate is that the inherent goal of yarnbombing and the status of the surrounding spaces cancel each other out and generate a third status-free, zombie-like space. The third observation is that the yarnbombing works are meant to convey notions of cosiness and warmth. They are meant to confer an intimate, private side to an environment, overriding its political and social aspects. 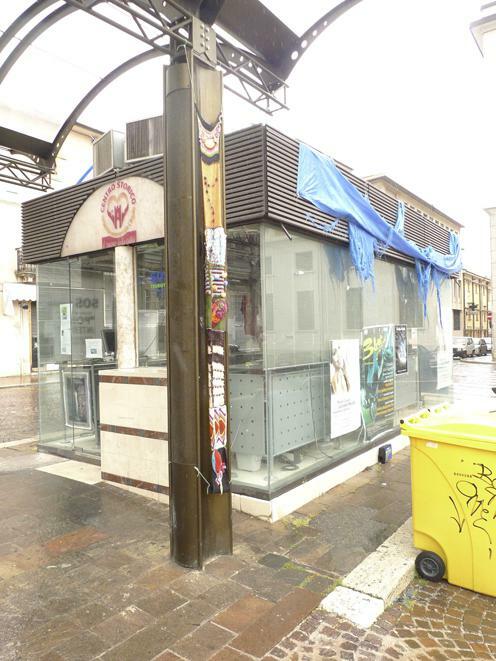 In this case, L'Aquila yarnbombing should redefine the surrounding public space, transforming it into a private, intimate realm in which private interests—including those of ownership and private funding—become the reference points. 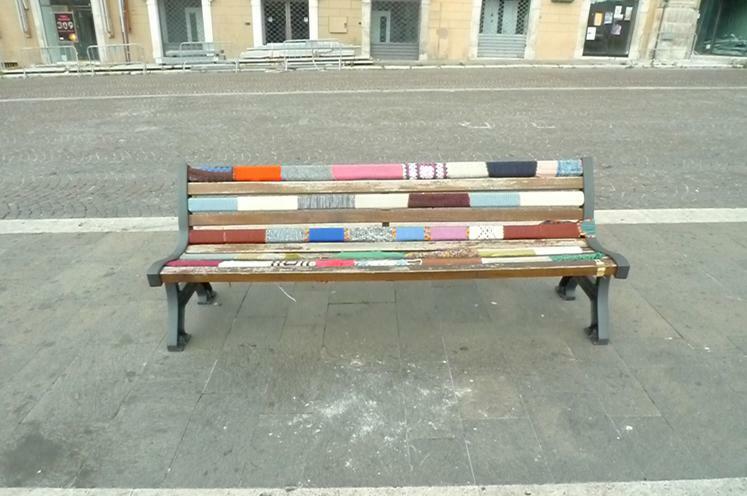 If we examine the first postulate, yarnbombing is a vain gesture, especially in L'Aquila. In the other two postulates, yarnbombing leads to the breakdown of political and social space. It dissolves society and does away with the figure of the citizen in terms of individual implication in the political and social sphere. These postulates underscore the disappearance of the sociopolitical realm in L'Aquila, which is reinforced by the transformation of the city into a zombie in the aftermath of the earthquake.The third postulate emphasises the tendency of the zombie-city to gravitate towards being subject to or controlled by private interests and non-public control. Looking at these photos through the filter of these three observations, I also realised that the yarnbombing never covered up company logos or other marks of private property. Even if objects such as telephone booths or building site barriers were completely covered, the logos or company names were left uncovered. Furthermore, I realised that yarnbombing pieces in general could be taken off the surfaces they covered without leaving any physical traces or material alterations. The L'Aquila pieces were even easier to remove than other yarnbombing works because the L'Aquila pieces were composed of a patchwork of little elements assembled together rather than large, continuous surfaces which would need time-consuming deconstruction. 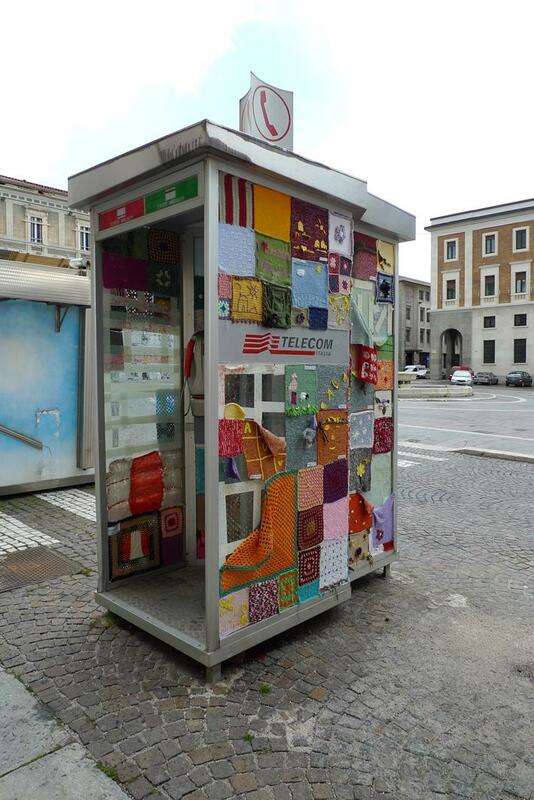 One might consider the yarnbombing works of L'Aquila as attempts to recreate a social “fabric” and its corollary political space, yet they were deployed with obvious respect for the dominance of the private financial sector or the remains of the city. The L'Aquila yarnbombings do not constitute challenging elements which open up debate. They convey and affirm the lack of possible discussion. The photos of these yarnbombing pieces further emphasised this affirmation. In the end my yarnbombing photos reveal a triple contradiction. First, there is the immediate incompatibility of the “mission statement” of yarnbombing and the space in which it was carried out. Next, there is a dichotomy between the message that the yarnbombing seems to convey at first glance and that which it really conveys upon close observation and study. Lastly, there is the fact that my photos, having been taken by an artist, should provide a departure point for debate, but in fact terminate any discussion. Faced with these contradictions, the images self-efface. They produce a void, an absent presence much like the absent presence of the city where the photos were taken. Not only do they represent this tangible absence, a rupture of meaning and the coherence of L'Aquila, but they also comprise fragments of the city, much like its molecular components or metastasis.